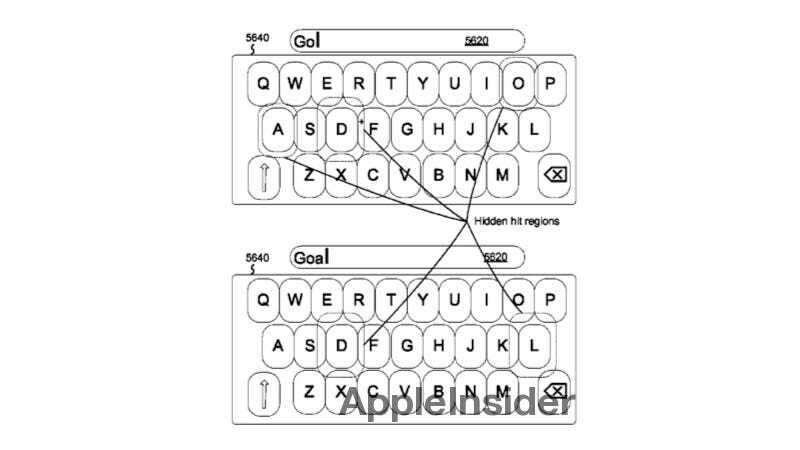 Apple has been granted a patent for a predictive text keyboard on mobile devices that will automatically increase the size of touch targets without actually doing so visually. Although this patent, which Apple Insider dug up, is bit confusing in concept, it's execution makes sense. In fact, the idea of implementing this idea without visual indicators actually makes this whole idea much more functional. Imagine you're trying to type the word xenotype on your smartphone. What if, after a few letters, your phone knew that's the word (or words) you may going for, but doesn't want to be too invasive. Instead, it quietly enlarges the radius of the trigger zone for the next possible letters in succession, but doesn't visually tip you off to this in any way. So as you reach for the O key and your finger accidentally hits P or I, the phone will still recognize it as O. Surely there will still be a way to intuitively override this in case you're intentionally misspelling a word or simply typing something uncommon. But this idea for predictive text is brilliant because it's helpful without overwhelming the user. It's something I'd like to see become real in the near near future (if it isn't already).